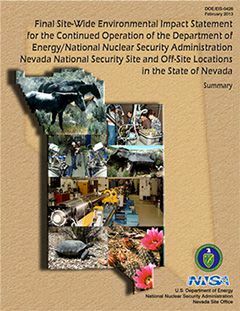 On February 14, 2013, the Final Site-Wide Environmental Impact Statement for the Continued Operation of the Department of Energy/National Nuclear Security Administration Nevada National Security Site and Off-Site Locations in the State of Nevada (SWEIS) was published, available electronically and in hard copy, the document can be obtained by accessing the links listed on the right or contact Public Affairs at (702) 295-3521 or email Nevada@NNSA.doe.gov. Stakeholder and public participation played an important role in the development of the final document, to include the several hundred comments submitted. Publication of this Final SWEIS, and the Record of Decision replaces the 1996 SWEIS and two Supplement Analyses that followed. The No Action Alternative reflects the use of existing facilities and ongoing projects to maintain operations consistent with those experienced in recent years at the NNSS and off-site locations in Nevada. For each of the three mission areas and their supporting programs, the level of operation for associated capabilities, projects, and activities is determined by operational levels actually realized since 1996. In other words, “No Action” is maintaining the status quo. The Expanded Operations Alternative includes the activities and level of operations under the No Action Alternative, plus expansion of existing activities and capabilities or new projects at the NNSS and off-site locations in Nevada. The additional capabilities and increased level of operations would include modification and/or expansion of existing facilities and construction of new facilities and greater numbers of activities than under the No Action Alternative. The Reduced Operations Alternative includes all of the types of activities conducted at the NNSS and off-site locations since 1996; however, the levels of operations for many programs would be reduced - relative to the No Action Alternative. The Preferred Alternative is a “hybrid” alternative comprising various programs, capabilities, projects, and activities selected from among the No Action, Expanded Operations, and Reduced Operations Alternatives. The final step in the SWEIS regulatory process was the issuance of a Record of Decision (ROD), officially announcing the agency’s decision to implement the Preferred Alternative.